Klartraum return on their own Lucidflow imprint with a new set of remixes of ‘Helping Witness’, featuring the talents of Helly Larson, Markojux and Yapacc. Klartraum duo, Nadja Lind & Helmut Ebritsch have between them released on imprints such as Soma, Darkroom Dubs and Morris Audio and have over the past few years built their own Lucidflow into a label to be reckoned with. 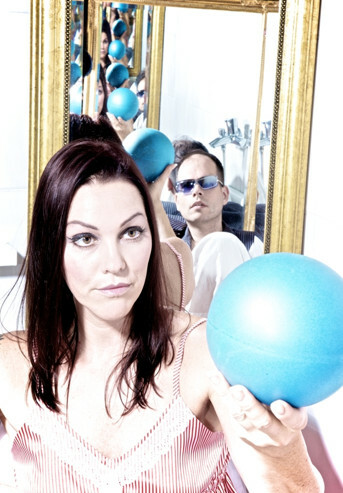 2011 saw the release of their critically acclaimed debut LP as well as Nadja’s own solo debut album. This single kicks off with the original version of ‘Helping Witness’, an entrancing, deep techy affair that uses a warm rolling bassline and heavily effected stabs and keys to create an otherworldly feel. Subtle vocals and piano notes added to the mix bring the track to life and an understated yet effective arrangement makes this track instantly impressive. The first of the remixes comes from Berlin based DJ/producer Helly Larson who deconstructs ‘Helping Witness’ and rebuilds it into a melodic house workout that draws on some wonderfully uplifting yet off kilter keyboard work, superb stuff. Next up is Pinksilver label boss Mark Baumann AKA Markojux at the controls. For his ‘Coast Road mix’ he turns in a deep and hypnotic version build around simple entwined melodies that has a true old school house feel to it. Finally, it’s Yapacc, a producer who has built quite a reputation with his releases for Perlon, WIR etc and a personal favourite of the Klartraum duo. Here he completes the package with an emotive and impressive remix that is the perfect final piece in the puzzle. 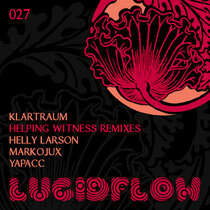 ‘Helping Witness remixes’ is released on Lucidflow on 2nd February 2012.